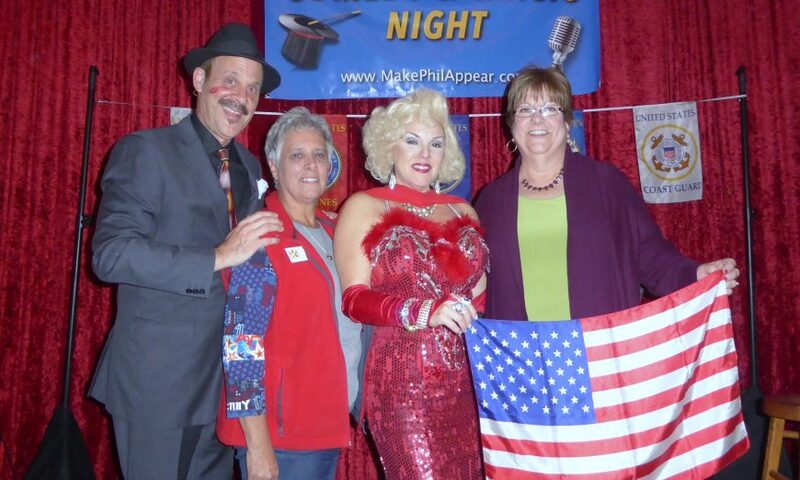 Professional magician Phil Ackerly ships care packages to U.S. troops stationed around the globe by magic. Not long after Phil and Terry Ackerly’s son, Scott, joined the Air Force in 2013, Terry Ackerly joined the South Bay Blue Star Moms (SBBSM), a support group for families with loved ones serving in the military. Phil Ackerly wanted to participate, too. “We need money to ship care packages,” SBBSM past president Donna Zolezzi told Ackerly when he asked how a dad could help. The post office doesn’t mail the care packages (flat rate, USPS boxes) for free. The only price reduction is a dollar off if a packages ships to a military base. Each troop member receives three boxes, one each of toiletry essentials, nonperishable food items and holiday gifts. It costs $45 to ship a three-box set. So Ackerly put his magic to work for the Blue Star Moms. In 2015, he organized a “Night of Magic & Comedy,” and contributed the profits to the volunteer organization. It became an annual benefit, raising almost $5,000 through 2017. 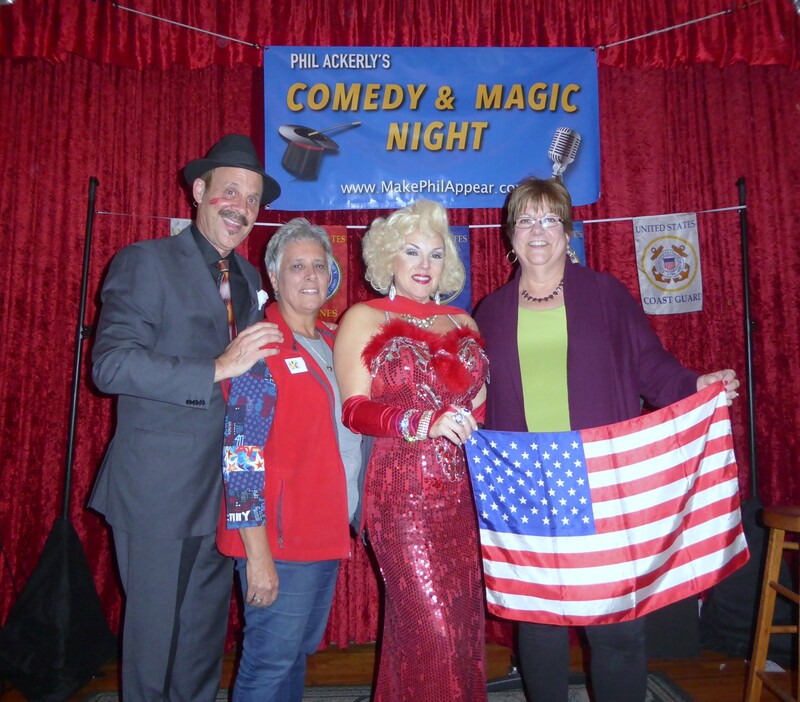 Headlining with Ackerly for the 2018 “Night of Magic & Comedy,” held at Rooster T Feathers Comedy Club in Sunnyvale on Nov. 14, were comedian Mickey Joseph and comic magician Michael Finney, 2018-2019 president of the International Brotherhood of Magicians. Marilyn Monroe (Camille Larrea with Celebrity Acts) made a surprise appearance, planting a kiss that lasted the entire evening on Ackerly’s cheek. Sunnyvale Mayor Glenn Hendricks presented Ackerly with a certificate of appreciation. Ackerly, a Santa Clara resident, had earlier received a letter from Mayor Lisa M. Gillmor. “It seems like it takes more than magic to carry out the program,” commented Sunnyvale resident Judi Pogue at the end of the show. Indeed it does. Ackerly starts planning in early summer — lining up sponsors, the venue and entertainers and working up new routines. Ackerly spent two years perfecting the masterful routine “Tamasudare.” It is an old Japanese tale using a mat of 56 bamboo sticks for visual effects. View him performing “Tamasudare” at https://vimeo.com/229798989. “If we can just learn to accept each other for who we are, no matter what our differences, then maybe one day this world will be a better place,” says Ackerly at the tale’s conclusion. One need not be a magician to give the troops the magic of opening a box from home for the holidays. Visit the SBBSM website for information: www.southbaybluestarmoms.org. The moms and volunteers meet on Dec. 8 at American Legion Post # 564 in Santa Clara to fill and ship 450 – 600 boxes. Who Knew Water Conservation Could be Fun?